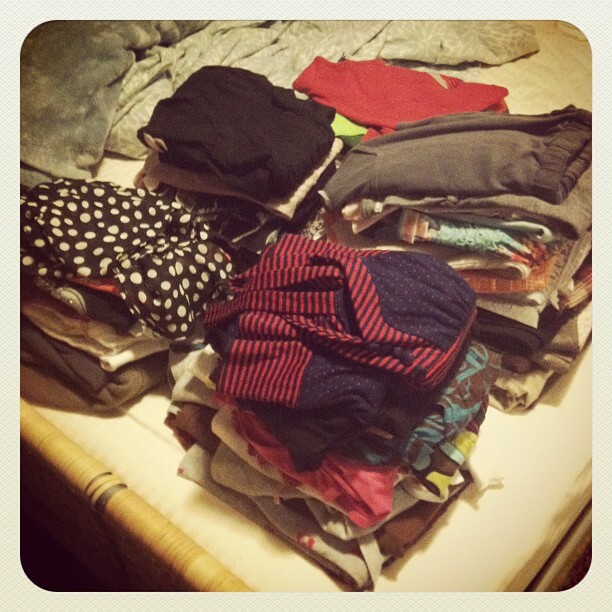 I recently got rid of so many clothes that I haven't worn in ages. My closest and our extra room were getting completely out of control! I had clothes stacked up in piles because I was running out of room in my closet & my dresser was already maxed out. I decided it was time to downsize & donate! And I've never felt more free! Now my dresser drawers easily glide shut instead of giving them a forceful push. And my once overstuffed closet now has a little extra breathing room! Ahhh, it felt so freeing to rid my closet of clothes that I hadn't worn in years. I had khakis from college, shirts from Forever 21 that were easily 4-5 years old (how those weren't all ripping at the seems I don't know...). I had dresses that I bought & only wore once & a zillion "sleep shirts" or "workout shirts" that just needed to be tossed. And the underwear drawer... That one got a major overhaul! I easily cleared out half of its contents! Anything dingy? Gone! Socks missing their other half? Trash! Now I'm left with only things that I want to wear. Less really is More. It's now much easier to look through my closet for outfit combinations, since I no longer have old clothes cluttering up the space to sift through. Believe it or not, it takes less time to put together an outfit because I can go right to what I'm looking for & not stumble over old items. And now there's the cleaning rule. Do you know about the cleaning rule? My sister told me about this & I think it's kinda brilliant. For every 10 pieces of clothing you get rid of, you can buy one in its place. Or, for every 5 pieces of clothing you get rid of, you can buy one accessory. I'm happy to report that I cleared 70 items out of my closet (not counting the underwear drawer, that all went straight to the trash)! Wow, that seems like A LOT. But trust me, I still have a lot that I kept, too. It doesn't look like it, but I swear there are 70 things here! CONGRATULATIONS on your new job!!!! YAY! I am always going through my stuff and getting rid of things, it makes life easier. What a great rule! I cleaned out my closet and have about 5 trash bags full of stuff to take to Goodwill - it's crazy how we hold on to things! And CONGRATULATIONS on your job! That's so exciting!!! Girl, I totally feel you. When I lived in Italy I only had as many clothes as I could bring over in a large suitcase. Having so few items made me get really creative with my pairings which I think really evolved my style. Good for you! Love those "rules"!! I'm working on cleaning out now. I have way too many things!